Some of the images you buy and sell can be provided in a variety of sizes. Those sizes define how large they are able to appear in the editor. 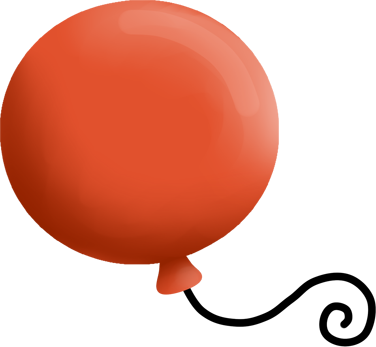 On the right, the heights possible in each size are demonstrated using a red balloon. Images of any size are capable of being shown in the editor in the size as sold and in any other smaller size as well. Thus full size items can be shown full size or in sizes 12 to 1. A size 8 item can be shown in sizes 8 to 1. A size 1 item can be shown only in size 1. Firstly, this introduces extra game play as you try to trade small images for larger versions. Secondly, when rare items are sold, we can provide smaller versions which will be less rare and more affordable. So if you cannot afford an extremely rare translucent hamster full size, you may be able to afford one in a smaller size. And because smaller sizes exist, over time you may be able to work or trade for smaller versions until you can trade for a larger one. This way we hope that everyone can aspire to have almost anything in the game in at least one size, and from there to aspire to having the largest and most expensive versions. We do not want a game with about ten valuable things everyone wants, yet only 1% of the users can ever have them. Sizes are a means to ensure there is always a way to trade up, and an image is always available in sizes you can hope to get your hands on one way or another.